Lighting A Revolution: Ink Blotter 150, "These Three New Lamps ...."
"These Three New Lamps Use No More Current Than One Old One." Blotter number 150; image number: LAR_B150. 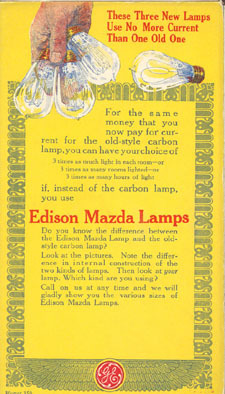 "Do you know the difference between the Edison Mazda Lamp and the old-style carbon lamp? Look at the pictures. 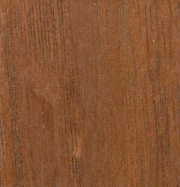 Note the difference in the internal construction of the two kinds of lamps. Then look at your lamp. Which kind are you using? Call on us at any time and we will gladly show you the various sizes of Edison Mazda Lamps." How does a company go about unselling a product after thirty years of marketing, especially if people are happy with that product? General Electric and other lamp makers found themselves faced with just that task in the years around 1910 as they introduced metal-filament lamps into the market. The new lamps could operate at higher temperatures than older carbon lamps and so gave better energy efficiency (at higher tempertures more radiation is emitted as light and less as heat). Lamps made with tungsten produced about 12 lumens per watt compared to about 4 lpw for the best carbon lamps. The tungsten lamps were more expensive to buy however, and for many years people continued to purchase cheaper carbon lamps. The blotter seen above shows GE emphasizing the advantages of higher efficiency by focusing on the cost of current. Sellers of compact fluorescent lamps today have a very similar problem and follow much the same strategy.